I’m here in London at the Mozilla Festival all weekend, where I’m joining Rebecca Mullen and Matt Thompson on the liveblog team. I just got to interview Alayna, who learned to make animated gifs for the very first time today and earned four Open Badges in the process. We got sheets of paper and positioned them. Then we put a webcam above the paper. We positioned the camera face down on the paper. Then we went to meemoo.org and took a lot of photos with the webcam to make the animated gif. Alayna also learned how to use Thimble to publish her animation to the web. Because Thimble is part of the Mozilla Open Badge program, she earned several badges in the process: the hyperlinker, editor, Thumble Projectizer, and (my favourite), the codewhisperer badge. Alayna’s badges are automatically collected on the Open Badge Backpack, where she can share them on the web. Sharing things on the web is familiar to Alayna. She tweets at @kittycatalayna and already has 77 followers. 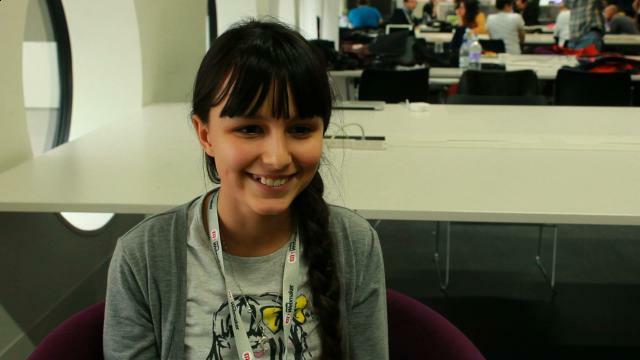 When we asked what she thought of the Mozilla Festival, Alayna described it as a fun event with lots of geeks in their 20s and lots of teens who are learning to make things on the web. And then she was gone, off to learn how to build hackable games.